Sue Santore grew up in Oklahoma, but has lived in Maine for the past 38 years. She has three children and four grandchildren. While growing up, reading was her favorite pastime. She still loves to read, but now her writing doesn’t leave as much time for reading. In her spare time, when not writing or reading, Sue likes to make quilts and play her mountain dulcimer. Sue has been writing for over twenty years. Fantasy and science fiction for all ages are two favorite genres in which Sue likes to write. She also writes Christian fiction. Her first fantasy book is A Singular Gift, a stand-alone book focusing on magic. 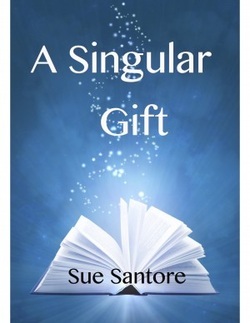 A Singular Gift is available on Amazon and Smashwords. She is currently working on a related book with the same two main characters. Jean Ryan inherits a singular gift, the gift of magic. She must learn to use her magic gift before the opposing dark magic forces destroy her world. Jean and Wayne, her friend, work together to discover why her gift has attracted the attention of an evil circle of magic users and how to combat them. "I never dreamed magic was real until my grandmother gave me the box just before she died. She told me to use the box carefully and that I was the only one who could use the box and the artifacts until I passed it on to someone else, that it rested on my shoulders now. But she didn't tell me what "it" was. At first I used the magic as a toy. I mean, what fourteen-year-old wouldn't? Doesn't everyone wish she could do magic? Soon I had to show my two best friends. Wayne, my oldest best friend, grew up with me. Karen, my new best friend, only moved to our town last year. Wayne helped me learn to use my magic, while Karen became obsessed with my box and kept trying to talk me into giving it to her. Horrible things happened. People almost died. Why did so many people want my magic box? With a sense of urgency hanging over me, I had to learn to use my new powers fast. Imagine my fear when I read Grandma's journals and found what she expected me to use the magical powers for. How could I possibly do this? How could I not try?"